Facebook provides various “Did You Know” (aka “Fun Facts”) questions (i.e. prompt) for users to answer. Supposedly, the identities of the creators (Facebook employees) of such stock Fun Fact prompts should not be accessible by non-employees. But it is accessible as of now. "title": "The annoying thing about opening a bag of chips is..."
"title": "My dream car is…"
"title": "My first pet's name was..."
Based on the value of each’s isCrowdsourced and attribution, we can determine that these three Fun Fact prompts are created by Facebook employees internally. In this request, we are going to use the three IDs of stock Fun Fact prompts obtained from Step 0. 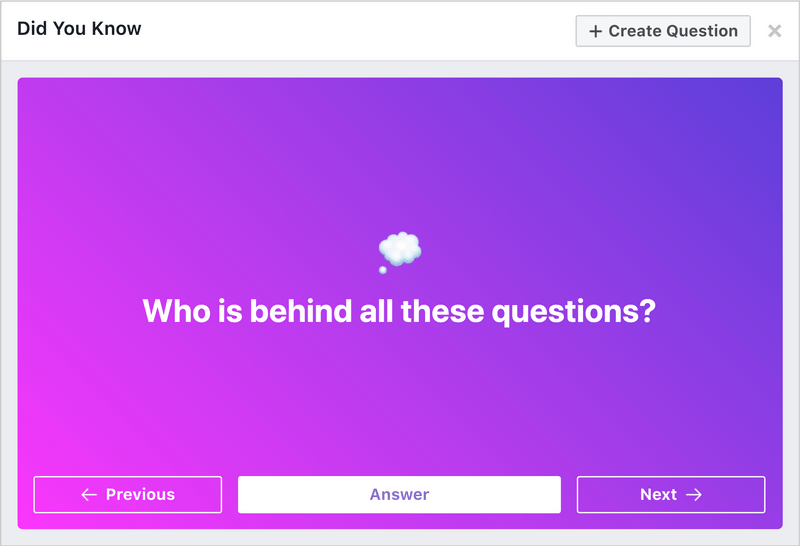 Based on this response, it indicates these stock Fun Fact prompts are created by (redacted), a “(redacted)” at Facebook. Non-employees should not have access to this information.